Communication and inclusion make a big IT task an unqualified success. Where did you get that hat? 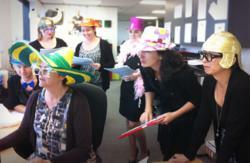 MediaWorks’ Finance team gets on with the serious task of testing their new Greentree system. Right from the beginning we wanted to say ‘This is your system as well as our system’. The day a new computer system is switched on is traditionally a tense occasion, as those who are going to be using it get to grips with all the new functions, and look for bugs. But at the Finance department of MediaWorks, New Zealand’s largest TV and radio network owner, launch day for their new system was party time. They broke out the fairy lights, donned silly hats, and celebrated an all-too-rare achievement: a major business software implementation that was virtually free of drama and stress. Big projects like this often get dubbed “Project Misery”. They consume too much valuable time (which in turn threatens to break the budget), those taking part get overloaded and fatigued, and end up delivering a disappointing result. And don’t forget the endless meetings, the plans that failed or never took off; not to mention the lingering suspicion that nobody but an elite few understands what’s really going on. When MediaWorks decided to invest in a new Greentree ERP system, project manager Michelle Mullins (who’s also the Finance Manager of the television arm, TVWorks) was determined to avoid those pitfalls. The keys to success, she believed, were good communication and the involvement of everyone who was going to be using the new system. “It was all about buy-in and creating some enthusiasm,” she says. As the functions of the new system were sketched out, Finance staff were brought into the planning sessions to advise on their specific tasks. The most tangible evidence of this enthusiasm was the “paper wall” in the Finance department, started by Michelle to generate feedback and ideas. This “Old School” approach provided the sort of visibility and interest that’s unlikely to occur in an email trail. People were encouraged to write on it, sharing their thoughts about the new system. “I wanted something that everybody could see, and it meant that when one person went to write something, somebody else would respond as well,” she says. It also meant that Megan Cunningham-Adams, the implementation consultant, had something to check each time she visited, enabling her to respond instantly to queries. “You can tell that things are not going well with an implementation, when a customer starts saying ‘Your system...’,” Megan says. “This never happened at MediaWorks – it was always ‘Our system’. After some seven months of intensive work by Michelle, the dozen or so core members of the Finance department, and the Greentree implementation Partner, the new system was ready for its test drive. On the big day, Michelle climbed on the desks of the Finance department, strung up fairy lights and raised a banner proclaiming ‘Greentree Go Live Zone’, to the astonishment and delight of her team. “They thought I’d had vodka for breakfast!” she laughs. The MediaWorks Finance team are all smiling about the new system, and their journey to achieve it. They say it was an easy process because of their involvement all the way through. The outstanding planning and teamwork meant they had less to fear, and being able to get immediate response to any concerns or queries meant that “Project Misery” was never on the cards. The last word, however, belongs to Michelle Mullins. “The other departments didn’t actually notice that we’d changed,” she says. “There was no bottleneck for payments; there were no excuses that we couldn’t do something because we were implementing a new system. The service we’d always given was still there, even though we were heavily focused on putting in Greentree. Read more about MediaWorks’ Greentree solution here.